A friend of mine sent this to me, I don’t know anything about it except that I’d like to have five screens on my Mac. Nice setup! Looks like a horrible arrangement to me. The small screen in the middle blocks part of the view of the ones behind it, and looks out of place. I think the stock trader guys who do a stacked grid (you know 2×2 or 3×3 monitors) have a much better arrangement in terms of usability and aesthetics. Not really sure what I’d do with that many screens in the first place. I’m currently running two cinema displays side by side, and have a third available, but don’t see the need to give up the physical desktop space in lieu of more virtual desktop space. Without knowing anything about the actual setup, I would guess that the center screen is a Wacom 21″ tablet that is mounted on an arm that pulls out and swivels. The other screens would then be used to display reference material as the artist draws on the extended center screen. 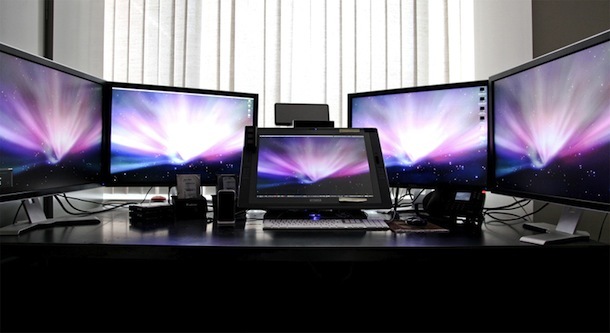 The Wacom screen could be angled to face any of the other four screens. In that situation, this arrangement would be quite effective. Look at the setup, there is two computers somewhere. He has two menu bars. While I know about “second bar”, it does not seem like that is what is producing the second menu bar. So it looks like two computers hooked up to either two or three monitors. I didn’t like it. I wouldn’t like to have this setup. They are ugly and all in bad positions.